This archaebacterial protein family has no known function. 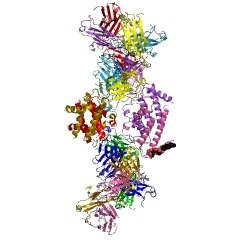 Members are predicted to be integral membrane proteins. This entry represents a group of eukaryotic and archaeal proteins. Eukaryotic members include EMC3, a subunit of the ER membrane protein complex (EMC) required for protein folding [(PUBMED:19325107)], and TMCO1, a ER calcium load-activated calcium channel [(PUBMED:27212239)]. Archaeal members may function as insertases of the archaeal plasma membrane [(PUBMED:26256539)]. There are 3039 DUF106 domains in 3036 proteins in SMART's nrdb database. Taxonomic distribution of proteins containing DUF106 domain. This tree includes only several representative species. The complete taxonomic breakdown of all proteins with DUF106 domain is also avaliable. Click on the protein counts, or double click on taxonomic names to display all proteins containing DUF106 domain in the selected taxonomic class.